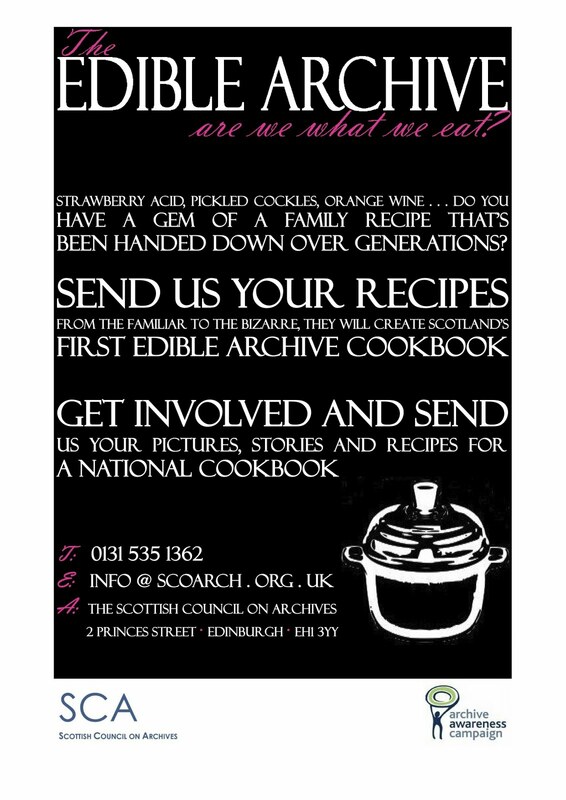 The Scottish Council on Archives (SCA) have launched a new archive project for 2011 seeking to compile a wide ranging history of Scottish recipes. As part of the National Archives Awareness Campaign, the SCA has been inviting both archives and the general public to contribute recipes to the project drawn from a variety of sources, including family history, personal recipe books, letters and archival documents. 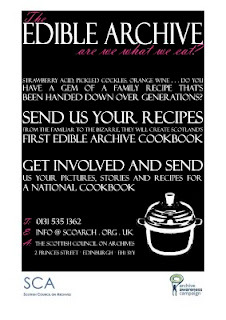 The project includes plans to host a feast in Edinburgh bringing many of the collected recipes to life in cooked dishes. A full article on the archive and some of its bizarre (and frankly extremely off-putting sounding) entries can be found here News.scotsman.com. The archivists spearheading the project make the point that it’s not so much the recipes they’ve searched for as the stories these recipes tell—one such illuminating example is a rice pudding recipe written in code in a letter from a Scottish soldier in India in 1808. The recipe is used as a practice exercise for his encryption skills. Not exactly poetry, but interesting nonetheless! Plus, who doesn’t like rice pudding. The SCA website can be found here, with an awareness campaign for the Edible collection. I’ll end with a ‘delicious’ sounding example from the collection for the baking of Locust Bread, taken from the archive of Mount Stuart in Bute, which was brought back to the island by the 4th Marquess of Bute following a trip to Tangiers…get baking. The best way to catch locusts is to repair to the nearest wall, the higher the better. Here, if the season be propitious, numbers of these insects will be found flying with such force against the wall that many will fall senseless to the ground. Of those that fall, pick up the females - they are somewhat larger and rather lighter in colour. Pull off the head as the head is pulled off a shrimp. Then squeeze the body and there will exude the eggs, like dark and diminutive caviare, to the amount of nearly a teaspoonful from each animal. When half a kilo of this spawn has been obtained in a small basin, mix with half a kilo of flour and bake into small loaves. Be careful not to let an opportunity pass to make this dish, as these little beasts make their visitation to the North of Morocco, at least, every nine years only. The last swarm occurred in Tangier in AD 1947.